In Roland Barthes's eyes, Philippe Sollers embodied the figure of the contemporary writer forever seeking something new. Thirty-six years after Barthes produced his study Sollers Writer, Sollers has written a book on the man who was his friend and who shared with him a total faith in literature as a force of invention and discovery, as a resource and an encyclopaedia. They met regularly, exchanged many letters and fought many battles together, against every kind of academicism, every political and ideological regression. Barthes shed light on Sollers's work in a series of articles that are still of great relevance today. Sollers, in turn, assumed the role of Barthes's publisher at Le Seuil from the publication of his Critical Essays in 1964, and was left deeply shocked and saddened by Barthes's death in 1980. 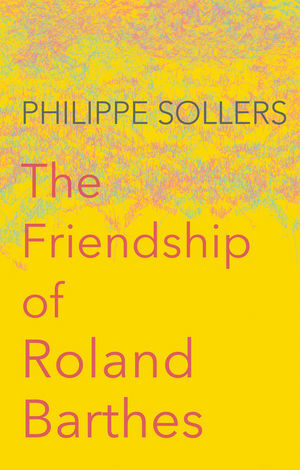 In short, they were very close to each other, despite their differences, and Sollers expresses here what this meant at the time and what it continues to represent, highlighting the themes that sustained their friendship. The book also contains some thirty letters from Barthes to Sollers, completing our image of one of the most extraordinary partnerships in French literary life. Philippe Sollers is a French writer, critic and founder of the literary journal Tel Quel. "These traces of an elusive life – a selection of letters by Roland Barthes, affectionate memories of him, and above all an evocative sketch of the precise place he occupied in a complex and combative intellectual history – add up to a compelling portrait of a much missed writer." "This engaging book will give great pleasure to fans of both Sollers and Barthes. Sollers writes movingly about his long-term friendship with Barthes in a way that is full of human interest – anecdotal, autobiographical, literary, and political. The letters from Barthes to Sollers are delightful, especially the inclusion of copies of the handwritten letters. The increasing intimacy of their friendship, always expressed via the deeply respectful French vous form, will fascinate lovers of the epistolary form as well as scholars and students of Barthes and Sollers."